In a very short space of time, Super Aguri has replaced Minardi as the small team everyone supports. Much of this is thanks to their showing last year, when they made their parent team, Honda, look a bit silly, especially in the first half of the year. Add to that Sato's famous pass on Alonso in the Canadian GP 2007 and their popularity becomes completely understandable. We all love underdogs, after all. Being the awkward old fart that I am, I do not go along with the general enthusiasm at SA's achievements last year, however. Oh, I like to see the underfunded teams doing well and wish SA all the best in their present struggle to survive. But I am not hugely impressed with their performance in 2007. They were running the Honda RA106, after all, a car that had won a GP the previous year and that Honda had expended an enormous amount of effort on to make it reasonably competitive with the front runners. If SA had not been able to beat Honda's dog of a car for 2007, it would have been quite surprising. To me, it seems that 2006 was the impressive year for Super Aguri. A team that is thrown together in a matter of weeks, has nothing but an out-of-date Arrows chassis to work on, fights through the initial ridicule at their efforts and comes through to finish in tenth spot in the final GP of the year- now that is something worth cheering about. No-one would have believed it possible at the beginning of that season. There are far more lessons to be learned from SA's first year in F1 than in their second. For a start, Toyota should be looking very closely at the early history of the team to see what they were getting right that the Japanese giant has so far failed to do. This may be more than Toyota executive pride can cope with but they are the losers for such an inability to humble themselves. Super Aguri is also a very clear demonstration of the fact that small teams have some advantages over the large and well-established ones. Apart from being able to react to changes very quickly, there being hardly any chain of command to go through, a small team is more likely to have a unified vision of where they are going, with fewer internecine struggles between designers. Take McLaren as an example. It has been very successful in the past and, as a result, has become a huge complex of design departments, each with its own head and charged with different aspects of the car. But it takes a very influential designer to gather all that up and provide unity of vision for each new design. It may well be that McLaren's historical success is now working against the team and that might be the explanation for there being no championship victories in the last few years. Adrian Newey is often cited as the last of the lone rangers, the designers who have sufficient influence and clout to be able to design the whole car. Yet even he has to work with other designers who may not share or understand his vision. It is now his third year with Red Bull Racing and we are beginning to see the fruits of his work - the RB4 is expected to be very competitive in this coming season. Ross Brawn goes to Honda and again the story is that we will see no real effect on the team's performance for a year at least. Yet Super Aguri went from being a joke to respectable contenders in a year only. The fact that a lack of funds now holds them back detracts not at all from what they have achieved so far. It has always been true that decent funding is necessary for success in F1, but it is not the only requirement, as Toyota have found. Aguri Suzuki is at present in Tokyo, attempting to hammer out a deal that ensures the survival of his little team. All our hopes should be with him as failure would mean much more than just the disappearance of one more team from the grid; it will underline the fact that F1 is unlikely to see any new teams entering in the near future, that the day of the small team is truly over. I agree that their first year was more noteworthy than last year but for a start up team with no money they are doing a good job. I think if I had money to invest in a GP team I would try Aguri before I would let Toyota waste it. The thing I find interesting is the number of people who claim to be totally against customer cars who are Super Aguri fans. I still don't understand how SA and STR are running customer cars with Max showing no signs of stopping them. Customer cars are not allowed so either stop people doing it or get the rules changed. You can't just ignore the issue because they are not winning. I think the reason Max doesn't interfere is that he wants customer cars to be allowed. The regulations don't actually outlaw them so there is no imperative that he do anything - it's the Concorde Agreement that states that customer cars are a no-no. And, of course, Force India is trying to get some sort of ruling on that through the Arbitration Court. It is a ridiculous situation, however, and has already caused the non-arrival of the expected entry from Prodrive. Until the issue becomes clear, I can't see any other teams trying to step up to F1. I know that there were times in the past when customer cars were welcomed (wasn't Max one who took advantage of that? I know Williams did). But I'm not sure that that is the way forward. I think it would just end up with half of the field being major road car manufacturers and the rest clones. However, I also think that the regs should be changed so that it is easier for new teams to come in. Of course, it's not just the entry that costs money, with the $40 million bond, but running the team through the year is the real challenge, as we can clearly see with Aguri, who, if they don't have the funds to test, clearly are too skint to do any R&D, let alone design next year's car. I think the $40 million should be a bond against a loan. I come up with $40 million in bond form and the FIA lend me the same against the bond. After a certain period of time, the bond pays the FIA back, but in the meantime I have some working capital. The whole Concord agreement mess seems to be the status quo that all teams want, even though it favours Ferrari. There are plenty of racers out there in other formulae, and I would hope that whatever deal does eventually get hammered out, that it takes into account that we don't just want to see the same manufacturers duke it out, with the same teams winning over and over again. Racing is done by racers, for racing fans, and if the manufacturers can't get behind a true racer and let them get about the business, then they should pack up and leave. I, for one would not shed a tear to see Toyota leave and be replaced by a smaller, scrappier team. Yes, another underdog, please. I am not so sure that allowing customer cars will lead to the situation you suggest, Arnet. Honda has already discovered that fnding a 'B' team can stretch the budget just a little too far, so I don't see a situation where all the manufacturers will effectively run two teams. And the disadvantage of buying in a chassis is that you are unlikely ever to beat your supplier's team - they'll keep the best bits for themselves. Who wants to enter a competition knowing that they can never win? Certainly the rules need sorting out. Customer cars are the way to encourage small teams into the game but there would probably need to be some limitations put on them, if only to keep the independent constructors happy. Letting teams use a customer chassis for two or three years, after which they must build their own, is one compromise solution I've seen. Yes, I'd forgotten about the compromise idea and that is one I would be content with. I think the situation with Super Aguri is quite different from what Prodrive had in mind. Aguri depends on Honda money as well as the car, while Richards was willing to pay for a McLaren and set up a team and headquarters around that. Honda set up SA because Japanese fans were outraged at Takuma Sato's being let go. So that would be the closest example we have to a manufacturer running two teams. I'm not too sure on why Richards wasn't willing to live in the grey area. Perhaps Ron didn't want to have some other legal entity own his designs. Torro Rosso on the other hand exists simply because Dietrich Mateschitz is that rich and most of Red Bull's expenditure-more than $1 billion/year- is in marketing. It fits more for him than it does for F1, really. I don't blame Stoddard for selling, but Torro Rosso is no Minardi, so I see it as a decline in the sport. Can you think of any other small team that had such loyal fans? And how many fans are passionate about Torro Rosso? And if any can be found, what is there to be passionate about? They are simply a marketing vehicle, not a true racing team. Red Bull, on the other hand, have a stable full of people with a rich history of racing and winning. TR have Berger. I guess the point I am not making very clearly is that I feel that the soul of F1-racers racing, fans enjoying-is being replaced by marketing. And look how that's worked so far for Toyota, Honda, TR and even Spyker/Midland. 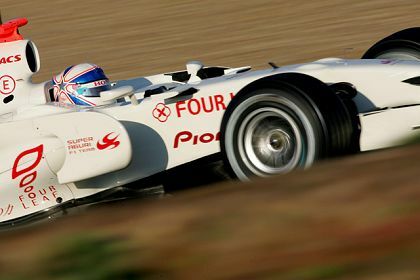 Rather than someone buy into F1 to promote their product, I would rather see a team from the juniors find backers and rise to the higher level, as did so many great racers before. I'm just a little nostalgic, see. Of course the other really impressive thing about Super Aguri in their first year was that they achieved what they did with what was effectively a fivce year old Arrows - that wasn't all that fast even when it was new. Sure, it had a very good 2006 engine, and there was some Aero work done, but not a bad job given they were working with a bitza car. All good points, Arnet, and proof that the influx of money into F1 has brought bad things as well as good. I feel that the sport is in a state of transition at the moment, feeling its way into the future, and one of the most immediate problems that needs to be addressed is the matter of survival of all types of teams. KERS and aerodynamic aids are all very well but, if the grids become half empty, they become a little irrelevant. Well, I did mention the old Arrows chassis, Patrick - and I agree that Super Aguri did wonders with it. Which highlights another possible solution to the customer car problem: allowing new teams to run cars from previous years, only banning the use of up-to-date chassis. The customer car thing is something hard for us Americans to understand. We tend to think that if you can buy it then you can use it. I have no problem with teams buying chassis and engines from the established manufacturers. We already know that the Team car will allways outperform the customer. Super Aguri was able to be so good because what Clive said above. The idea of having a small team means that a mistake can be caught sooner perhaps. Less beauracracy to go through to make decisions. Yes I love the underdog but a customer team would be an underdog also. We would still like "our" team but it was so nice to see that SA car pass the factory Honda last year. We could have things like that happen more often. Maybe the solution is to use the "last year" chassis. Frank Williams is so afraid of customer teams but why cant he become a supplier. How many chassis a year would a customer require. Exactly double what Williams uses now. They could look at it as source of income for them. This brings me to the idea of recruiting new teams. In order to do this F1 needs to subsidize the new team. Some suggested that that whoever joins post a bond of 40 million then in turn F1 loans the new team the 40 mil to be paid back in the next 3 years. Look we all have suggestions on how to handle the customer team concept. Every one of have different and emotional ideas on the whole concept. The one thing that we can agree on is that we would like to see a 12th team. Putting Concorde aside for now, the real issue is how to attract a new team. I feel that if a new team cannot buy cars from established teams no one will put out the money for it. Running B team is not the answer either. I want a team that is completely autonomous in management and decicion making. I want to see more cars on the track. Ulimately I would like to see more teams able to compete for the championship on a regular basis. The shrinking grid does look like being a major problem for F1, John. It doesn't seem that long ago that the entry list was so over-subscribed that pre-qualifying was necessary. And I agree with you that the way the problem is tackled is far less important than actually tackling it. At the moment nothing is being done. One thing that was entirely predictable and predicted when Max and Bernie went courting car manufacturers was that as soon as it was expedient or they embarrassed themselves sufficiently they would leave without a backward glance. Ford discovered that Jackie Stewart knew more about how to run an F1 team than they did and left. Carlos Ghosn is looking for any excuse to pull Renault out and Toyota are trying to figure out whether it is more a loss of face to skulk off with their tail between their legs or to be humiliated by their customer. The history of F1 is littered with manufacturers doing what is known in sales as the Mary Poppins act. They pop in then pop out and then pop in again a few years later. As sponsors or engine suppliers this is acceptable but it was stupid to encourage them to buy teams. If the suppliers all decided to leave tomorrow and fold the companies they own what would happne to F1? I would like someone to tell me how F1 progresses without customer cars. Without wishing to evoke Margaret Thatcher there is no alternative. On Arnet's point about McLaren IP. Ron would have no problem with another entity owning his IP. Any business that generates Ip sets up another non-trading company to hold it so that if the trading company goes bust they don't lose the IP so McLaren's current IP will not belong to the racing team but to another company in the group. There is no need for Prodrive to actually own the IP as such it could be held in a Prodrive nominated company which had Ron and Mansour Ojjeh as the main shareholders. I agree with your comments on customer cars, Steven - they will have to be allowed sooner or later. As regards IP (Intellectual Property), your suggested method of dealing with it was the one taken by Red Bull and Toro Rosso, I think. And that is yet to be tested in the arbitration process. Dave Richards must have looked at the possibility and decided that, since there had been no ruling on it either way as yet, it was too risky to take that route with an F1 entry from Prodrive. I tend to agree with Steven Roy. I have often thought of how would F1 survive if the manufacturers pulled out. This idea, I am sure, has been thought many times by Toyota and Honda. We can not fathom that Ferrarri and/or McLaren would pull out. But what would happen if Toyota and Honda left. Renault would be close behind. The survival of F1 depends on customer cars being allowed. These companies need to be able to spread the cost and not have the entire burden on them alone. For Bernie and Max to bury their heads in the sand on this issue may hurt the sport more then we imagine. This should be their priority this year. Nothing else, they have to solve this problem sooner then later.